We often have certain preconceptions about certain groups of people. Driven by such preconceptions, when we come to know a person’s group identity, we presume we know everything worth knowing about them. For example, if we label people belonging to a particular religion as fanatical, we reduce everyone from that religion to that label. However, people’s behavior is determined not so much by their group identity as by their own individual level of consciousness. Gita wisdom explains that everyone is an individual soul with personal autonomy. The group in which they were born and brought up certainly shapes their behavior, but doesn’t determine it; their conditionings from previous lives also shape their behavior. And ultimately everyone has free will. Phrased in terms of the Gita’s analysis of the three modes of material nature, how we use our free will is affected by the modes infecting us. 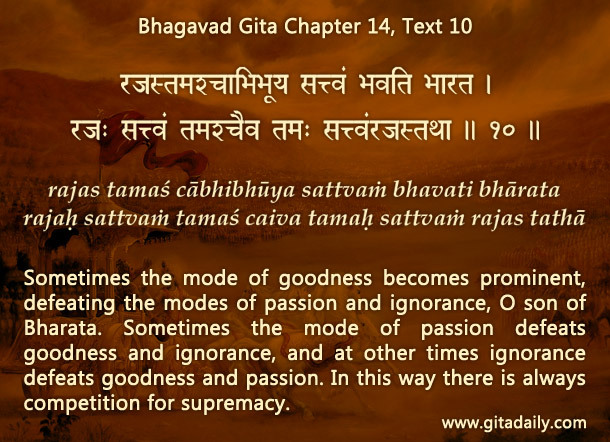 These modes are constantly competing with each other (Bhagavad-gita 14.10). Such tussle between the modes happens not just within individuals but also within groups. Every group has some people in each of the modes. And those people, despite being in the same group, will differ significantly based on their modes. Even within a religion considered fanatical, some individuals will be moderates, being in the mode of goodness, and some will be fanatical, being in the mode of ignorance. Moderates from different religions may concur on how to calmly address their differences. In contrast, extremists from the same tradition may attack or even assassinate each other over differences that they deem heretical. People’s behavior is shaped much more by their modes than by their group identity. How do moderates and extremists deal with differences differently? What are the advantages of treating everyone as an autonomous soul? Has interacting with specific individuals from a group led you to revise your preconceptions about that group? Amazing analysis into the psyche of people.